For data center and remote network applications that require low-speed connections, the Data Connect ST3342E-208-4 commercial modem incorporate the latest advances in modem design to deliver efficient and reliable performance. The Data Connect ST3342E-208-4 commercial modem has been developed to meet the most stringent environmental and performance demands of the commercial and industrial application. Every relay, transformer, capacitor, switch and connector is selected for its ability to withstand industrial environmental demands. At connect speeds of 33600bps and below, our patented Quick Connect features reduce modem connect time by as much as 50%. 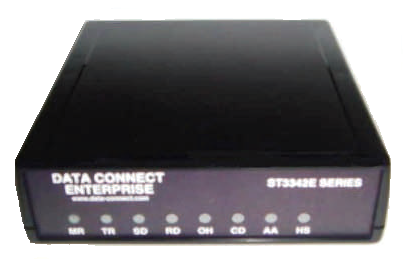 The Data Connect ST3342E-208-4 commercial modem is available in commercial single port standalone configurations. Rack mount configurations are also available. V.42 and MNP 2-4 error correction. Standard AT commands for both local and remote configurations.